It's nearly Halloween so I thought I'd share a photo of a true cow pony. Yes, that's a pony underneath the bovine attire. And I'm the guilty party who had an abundance of felt, a hardy sewing machine and far too much time on my hands. One year, when I was consumed with competing on the local county circuit and staying in contention for year-end awards, I became very ill and required some emergency abdominal surgery. Needless to say, I was suddenly out of competition. Literally. So when it came time for the annual end-of-the-year championship show-- held each October the week of Halloween -- I had to find some way to still participate. So along with cheering on my barn buddies who were vying for the year-end titles, I decided to create an entry for the costume class! I designed a cow costume for a very compliant pony hunter in my trainer's barn. My victim? A pudgy gray mare named Amanda. I made my own pattern, holding tracing paper up to Amanda's body and measuring with a tape as I went along with a felt-tipped pen. Then I cut and sewed and glued felt together, also attaching wide strips of elastic to the "cow legs" so that Amanda could step into her "cow pants." The mask was the best part, as then Amanda was truly a cow and not a pony. My trainer, Susan, dressed up like a farm girl. She borrowed a big brass cow bell from her neighbor and hung that around Amanda's neck, and then carried a real life baby calf bottle. The class was huge! But Amanda was the only horse or pony wearing a costume from head to tail. That, apparently, disturbed the other entrants because as Susan led her into the arena there was much snorting and prancing and whirling. Poor Amanda! We could see the expression in her big brown pony eyes through the cut-outs of her cow mask. She looked as if she were saying, "Hey, it's just me: Amanda. I've been competing here all week. What's wrong with you guys?" Obviously, Amanda was unaware she'd been transformed into a cow. Fortunately the other four-legged entrants soon calmed down. I think they all acclimated to the bizarre outfits of all the other equines and figured it was simply the silliest darn horse show class they'd ever participated in. When the awards were announced, Amanda had won. I was so happy! Even though I wasn't able to ride in the championship show that year, I was still able to participate, even if it was on the sidelines, and even if it was as the costume designer to the cow pony. However you celebrate, I hope you have a happy, safe Halloween! Great costume! You got yourself a champion cowpony for sure! Thanks, Beth! I guess I got so caught up in my costume designing skills that I couldn't stop. The very next year I designed an Eeyore costume for Amanda the pony. Sort of the same idea: she was totally covered, mask included. And this time Susan (my trainer and Amanda's owner) dressed up as Winnie the Pooh. That was fitting, as she was very, very pregnant at the time! When the awards were announced, we'd won again! However, that was it for me. To this day, whenever I look at a bolt of felt fabric, my hands start to shudder in revolt. I LOVE THE COSTUME! YOU COULD PROBOBLYSELL THOSE. THAT BEATS ANYTHING MY HORSE AND I HAVE DRESSED UP AS! Thanks! 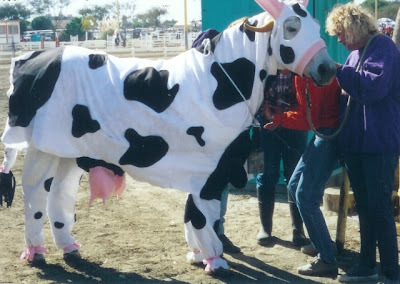 What's funny is that the year after the Cow Pony costume, several other people asked to borrow it. I wasn't sure it'd come back in good condition, so I declined. However, eventually I did donate it to a therapeutic riding program and they used it for one of their mid-sized ponies (I think a Norwegian Fjord, actually) to wear in a costume class. So it got some good use!